It’s that time of year again. Winter has rolled in, and it brings with it cold temperatures, snow, and the dreaded dry skin. 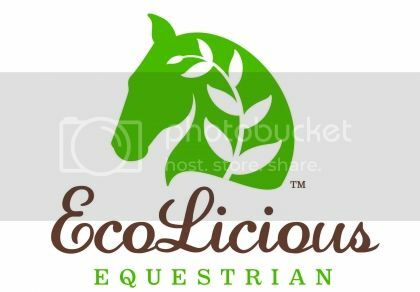 So I was thrilled to find some Ecolicious Equestrian products in my stocking this past Christmas (my parents know me well!). I’ve long been a fan of Ecolicious for a variety of reasons, and reviewed their Hands On Therapeutic Barn Hand Repair Lotion here last year. Its a great product that I still use to keep my hands feeling moisturised. I’ll be the first to admit that at the best of times, I have dry skin. But to make matters worse, I also suffer from sensitive skin, which makes it really hard for me to find a moisturising cream that both solves the dry skin problem, without causing further skin irritation (and, worst case scenario, hives). While there are a wide range of skin products on the market these days, many have chemicals or strong perfumes that my skin reacts negatively to. I generally have to stick to the extra strength, scent free creams certified for eczema sufferers (which I don’t have but find is the only cream that works). Sadly, while I have found that these creams do work, they don’t really satisfy the girly side of me that wants a cream that both moisturises and smells nice (since I can’t wear perfume, or use heavily scented body washes). So when I unwrapped a tub of Ecolicious Equestrian’s Hey Sugar Nourishing Body Butter, I was excited and cautiously optimistic that my skin cream dreams may have just come true. But, keeping in mind my previous skin care battles, I figured the best way to get a sense of just how good this cream was was to put it to the test against my current department store unscented, extra strength lotion. I evaluated the body butter on 5 different categories, to see how it stacked up to other products I have used (and am currently using), and just how it stood as a product on its own. I evaluated these categories based on prior experience of what I did and didn’t like with other creams, as well as my experience using the product over a period of time. Is it easy to get at the cream? Does the packaging clearly tell what the product is? Does it actually do what it promises? Is it greasy to apply, does it leave your skin feeling greasy? More or less expensive than what I am currently using? How does it compare to current departments store creams, price wise? To put the Hey Sugar body butter to the test, I used it exclusively for 7 days (every morning) to see how well it worked to keep my skin nourished. First impressions of the product were great, the packaging is simple but pretty, and clear. It says what it is, what’s in it, and what to use it for. The container is a twist top plastic tub, that opens easily so you can get directly at the cream contained inside. Opening the container you find a thick white body butter that smells absolutely amazing. This excited me, but also worried me, as my skin often reacts negatively to anything with a strong scent in it. Though these fears were abated after the first use (if my skin is going to react badly, it usually reacts almost immediately after application), the body butter went on smoothly and no allergic reaction or skin irritation (hooray!). I’ve now been using this body butter for close to two weeks, with no negative implications, and it has continued to keep dry skin at bay! So it does do what it promises. When compared to my current cream, the Hey Sugar body butter doesn’t quite beat the itch the way the eczema level cream does, so that was a bit of a downer for me personally. But for most people with dry skin it will undoubtedly do a stand up job. Just for those with really bad dry skin, it may need to be occasionally paired with a stronger department store cream. 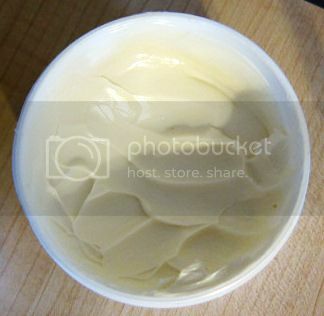 The cream is thick like many body butter style creams you will find on the market. A little bit goes a long way with this product, and I found that on average (daily) I would use the equivalent of maybe 1.5 – 2 teaspoons worth of cream to cover my legs, arms, shoulders, chest and back. This is comparable to the current department store cream I have been using, in which I use about 2-3 pumps of lotion. The Hey Sugar body butter is smooth to the touch and not greasy, which is a definite perk as I really don’t like greasy skin cream. It applies well, rubs in completely, and doesn’t leave any greasy residue on the skin. After application my skin is soft and smooth, and smells pretty amazing! I also found it didn’t leave my hands feeling greasy either, which was great for application on the go, as there was no need to rinse greasy clotion residue off my hands (bonus!). For someone like me, with mild/moderate sensitive skin, I was pleased to see that I could not only read the ingredients but most of them were natural or naturally derived (like the packaging promised). Its also free of paraben and silicone, which is a plus. I think this is great not only because it makes for a more natural, environmentally friendly cream but, for someone like me who is allergic to manufactured artificial scents, it allows me the option to have a cream that actually smells nice, without irritating my skin. Note: this cream worked great for me, even with sensitive skin, but everyone is different. I think natural ingredients make it better than some products on the market, but everyone’s skin (and allergies) are different. Though I would definitely give it a try! The 236 ml (8 oz.) 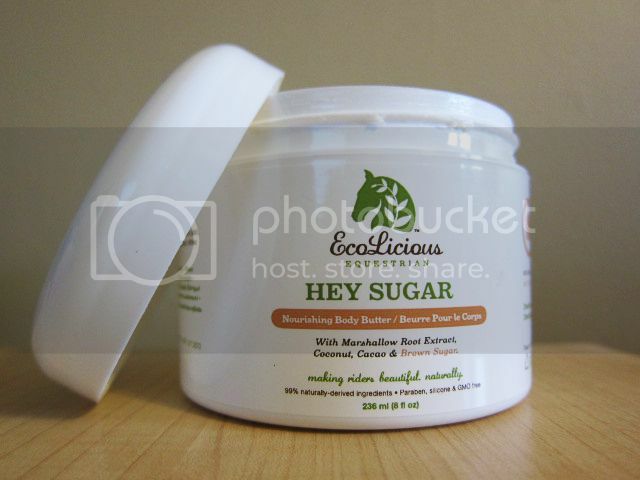 container of Ecolicious Hey Sugar Nourishing Body Butter retails for $23.95 CAD. This is a bit on the higher end in terms of cost of lotion, especially when compared to most department store lotions. I pay about $10 CAD on average for a 480 ml bottle of my current lotion, so it is a bit more expensive. Though it is comparable to some of the higher end department store lotions, that retail around $15-20. So it really depends on the type of lotion you have been using, and what you pay for it. I do have confidence that the product will last awhile, as not a lot is needed for application, so that does help the price point. Try it for yourself, or check out the range of Ecolicious products for horse and rider by visiting their website. 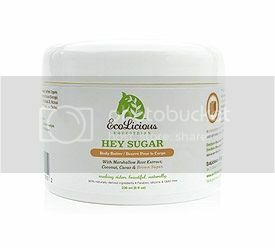 I was impressed with Ecolicious Equestrian's Hey Sugar Body Butter, and I would buy it again. It does nourish dry skin, it smells good, is composed of primarily natural ingredients, and is non-greasy. It has a lot of things going for it, and you really can't beat that brown sugar scent.